5 Bedroom 4 King beds & 2 Twin beds, Three Bath, Well Equipped Kitchen, Lots Of Parking Space. 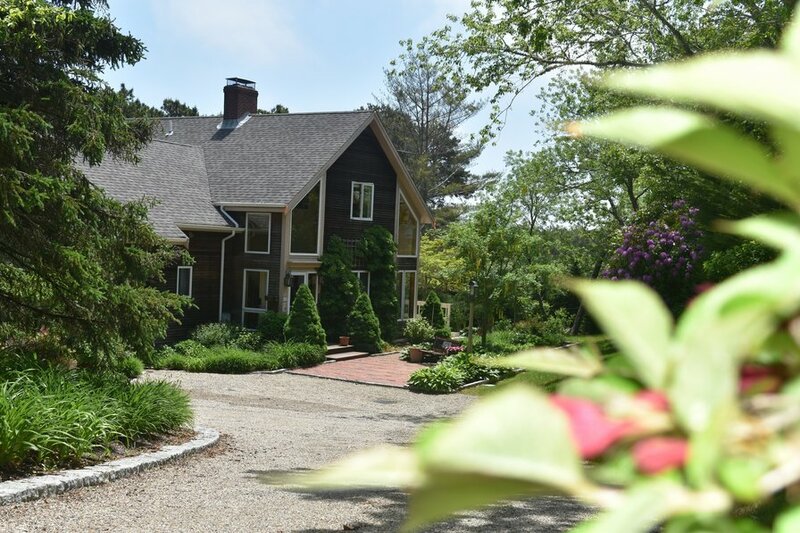 Located on the elbow of Cape Cod in Chatham, Massachusetts USA, the location is perfect for a New England vacation. Go to the beach on a whale watch, a seal tour, shop in the one of the 300 boutiques and shops in the downtown area and go to one of the many spectacular seafood restaurants. For a day in the big city, Boston is a 90 minute drive away. 4 King bedrooms (two with private decks), two twin, three bath home with outside shower with hot and cold water. Granite countertops in the kitchen which is equipped with all new pots and pans, coffee pot, electric tea kettle, crock pot, griddle, hand mixer, 4 slice toaster, blender and more! Sunroom, stainless steel gas BBQ. The large living room has a 55 inch Ultra HD TV (4K) ceiling fan and seating. There is also a reading room on the first floor with plenty of seating and a Captains Wheel table. The large lower level has its own king bedroom and kitchenette, 65 inch Ultra HD flat screen TV, full height windows and its own private entrance. Professionally decorated in June 2016. All furniture, pillow top mattresses and new comforters. As with most Cape rentals, you will need to bring your own sheets and towels or rent them. Jeanie can provide you with a list of local linen rental companies. Flat screen smart TV with cable with upgrade to NESN, NetFlix, Bose speakers on deck with Yamaha receiver, free long distance calls, secure wireless internet, keyless entry, FREE long distance calling, lots of indoor and outdoor games. Beautifully landscaped, three decks plus a patio for true indoor outdoor living. Located in historic North Chatham, it is only a short bike ride or walk to two town landings. Only two miles to the center of Chatham where you can enjoy band concerts on the green, take in a Chatham Anglers baseball team, or simply enjoy strolling down charming Main Street which is littered with boutiques, restaurants and antique shops. Three full bathrooms all with showers (one with a large jacuzzi tub with skylight). Other features include outdoor shower and changing room, fully air conditioned, sound system in kitchen and on outdoor deck, two kitchens, laundry facilities, ample parking, security system, secure wifi and high speed internet, CCTV security cameras outside. There is also 1 double sofa bed in Family Room, 2 single sofa beds in Singles are 2nd Floor balcony, Double is lower level family room. The property is close to the Chatham bike trail.